The demand within the global market for vascular graft has been rising on account of advancements in the field of cardiology, finds Transparency Market Research (TMR).The market vendors in the global market for vascular graft have been making ardent efforts to ensure a regular inflow of revenues in their kitty. The competitive dynamics of the global vascular graft have intensified in the past few years. In other words, the vendors operating in the global vascular graft market have locked horns with themselves, and have earned key reward points. There is also a high possibility of new strategies and business plans being introduced by key vendors. 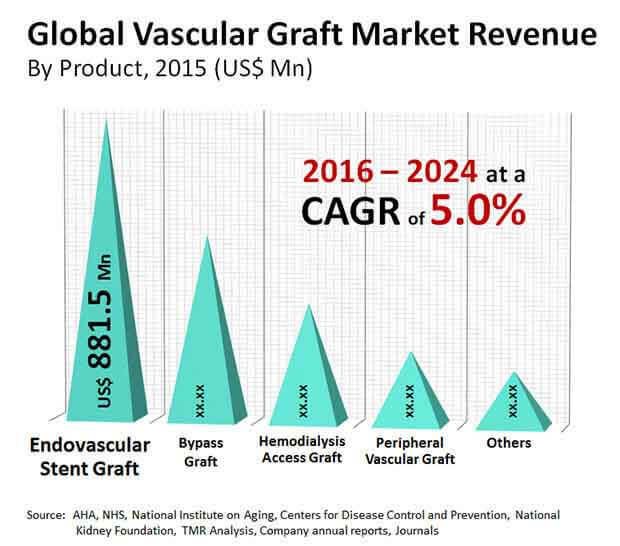 The market vendors with a large consumer base in the global vascular graft market have been overpowering the ability of smaller vendors to sustain in the market. Since vascular grafts need to be of improved quality, the larger vendors have capitalised on manufacturing effective products. The smaller market vendors are expected to struggle to stay relevant in an ever-changing healthcare industry. It is also expected that the global market for vascular graft would become less fragmented in the forthcoming years. Some of the key vendors in the global vascular graft market are C.R. Bard, Inc., Cook Medical, Inc., and MAQUET Holding B.V. & Co. KG (Getinge Group). Transparency Market Research (TMR) finds that the global market for vascular graft would expand at a steady CAGR of 5.0% over the period ranging 2016-2024. Furthermore, the cumulative value of the global vascular graft market was US$2.15 bn in 2015, and is expected to touch a figure of US$3.29 bn by 2024-end. The regional segmentation of the market for vascular graft is led by North America in terms revenue. Furthermore, on the basis of product, peripheral vascular stents have gained popularity in recent times. The use of vascular grafts spans across multiple domains within healthcare, especially cardiology. These grafts help in redirecting the flow of blood inside the arteries, and this factor has led to their widespread popularity. Furthermore, the presence of a seamless cardiology sector has also played an underhanded role in the growth of the global market for vascular graft in recent times. The treatment of coronary artery disease also depends on proper execution of vascular graft. Hence, there is no contention about the assertion that the global vascular graft market would expand at a boisterous pace in the years to come. The demand within the global market for vascular graft has risen alongside advancements in the field of healthcare. Several healthcare entities and external organisations have made voluminous investments towards better vascular care. For this reason, the global market for vascular graft is expected to become a haven of lucrative opportunities in the years to come. Moreover, the treatment of vascular occlusion, aneurysm, and renal failure is also done with the help of vascular graft market. This factor has also created commendable opportunities for growth within the global market for vascular graft. The review is based on TMR’s report titled, “Vascular Graft Market (Product - Endovascular Stent Graft, Peripheral Vascular Graft, Hemodialysis Access Graft, and Bypass Graft; End User - Hospitals, Ambulatory Surgical Centers, Specialty Clinics, and Cardiac Catheterization Laboratories; Source - Synthetic, Biosynthetic and Biological; Application - Coronary Artery Disease, Aneurysm, Vascular Occlusion, and Renal Failure) - Global Industry Analysis, Size, Share, Growth, Trends and Forecast 2016 – 2024”. Transparency Market Research (TMR) is a market intelligence company, providing global business information reports and services. Our exclusive combination of quantitative forecasting and trends analysis provides forward-looking insight for thousands of decision makers. TMR’s experienced team of analysts, researchers, and consultants, use proprietary data sources and various tools and techniques to gather, and analyze information. Our business offerings represent the latest and the most reliable information indispensable for businesses to sustain a competitive edge.